With the release of The Force Awakens in 2015, the Star Wars franchise has launched to global fame even further (if possible) with new records set and new audiences reached - and this is only due to continue during the growth of the gargantuan franchise thanks to a wave of new stories based on the classic hits and the lesser appreciated yet still somewhat popular prequels. This time round, we jump back to a time between prequel Revenge of the Sith and it's narrative sequel, 1977's A New Hope, to explore the formation and crucial mission of the titular squadron and how it then influences the key plot elements of the main series. Directed by the increasingly famous Gareth Edwards, known for work on 2014's Godzilla, the film focuses primarily on the fugitive Jyn Erso (Felicity Jones), who finds herself bargained into assistance for the Rebels due to her knowledge of the criminals they pursue and how to bring them in. 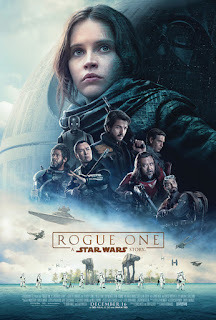 During her quest, primarily joined by Cassian Andor (Diego Luna) and reprogrammed Imperial droid K-2SO (Alan Tudyk), she finds herself discovering more sinister plans than initially expected and works hard alongside the newly dubbed Rogue One squadron to conquer them before lasting damage is done. As a prequel made so late after the films surrounding it, Rogue One has to achieve the careful balance of nicely intertwining the characters and existing plot elements without adding unnecessary twists or manipulating the beloved storylines in a way that dismisses their original design from the original films - and thankfully this is achieved greatly for the most part. The story flows nicely and is simple enough to follow at times even for those who aren't serious fans of the franchise - this opens it up to a wider range of viewers and demonstrates stronger effort from the writing/directing side of things as a whole. 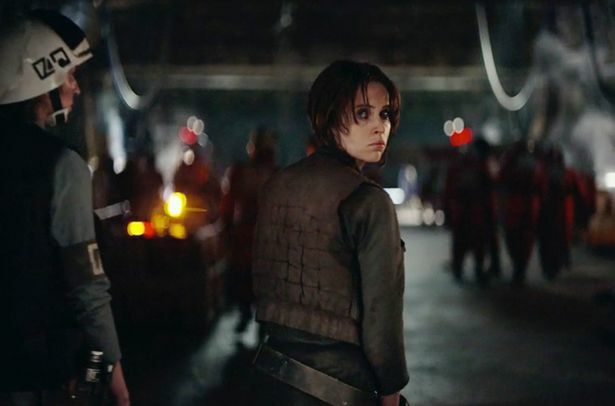 The story is also brought to life by some great performances - whilst Jones is a little bland sometimes in her lead role, the character is still interesting to watch, which can be said as well for Luna as Cassian Andor. However, perhaps the key performers are Ben Mendelsohn as key antagonist Orson Krennic and Alan Tudky as brilliantly charming comic relief K-S20. With the usual big budget and, well, being a Star Wars film, you can't expect bad special effects - and that's proven correct from the get go. The CGI visuals craft some fantastic set pieces and alien characters, and is especially impressive when generating the likeness of Peter Cushing on stunt actors to recreate the classic villain Governor Tarkin - it's of course quite noticeable at times next to actual people, but still incredibly well composed when it comes to the level of detail in almost every aspect. Perhaps the key flaw is the initial pacing, where the film jumps between locations at a very rapid pace and seems more keen at times on showing storm troopers getting knocked down more than in bringing more story elements to fruition; similarly, the final set piece finds itself being a whee bit too long. Whilst it's epic and full of some amazing moments, all brought to life with stunning visuals, it ends up becoming a little repetitive and dragged out for no solid purpose other than to shove action in your face - which does get tiresome. That aside, Rogue One finds itself being another impressive entry to Disney's reintroduced Star Wars series, and should this level of quality keep up, some more good stuff will be on the way.